This new lifestyle holds many attractions for us; getting to meet people, exploring new places, and the chance to leave our weekly 8 to 5 routines behind. This weekend we met some lovely people that already live full time on the road. On Friday we met Vicky White. I had read an article in a magazine about a lady named 'Vicky' who sold her belongings in Canada to live in New Zealand. She found an ideal bus, which is now her home and has since travelled around exploring N.Z. There is a Facebook group called 'Motorhome Friends New Zealand" that we are members of and so is Vicky. Through this forum we've seen photos that Vicky has posted and read her comments, etc. We were impressed that she was doing this lifestyle on her own. 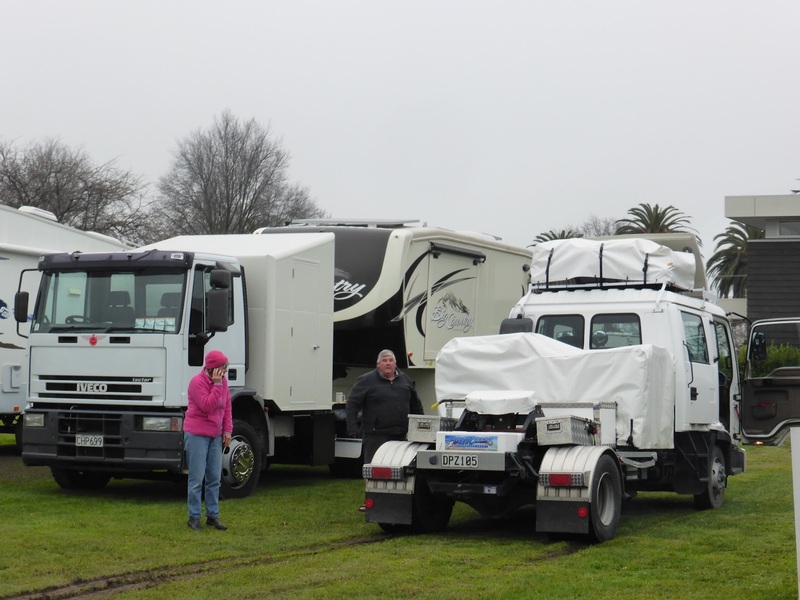 Our friends Amanda & Paul Walters did some motorhome maintenance for Vicky when she arrived in Nelson. Amanda contacted me knowing that I was keen to meet her. So Bernie and I went and had a coffee with Vicky, Amanda and Paul. I wanted to get a photo of Vicky but I felt a bit shy to ask. But here is the article that was written about her recently. Another couple, Bill and Mimi Lloyd, have been on the road for 18 months. Their home on wheels is huge. It's a 'Big Horn' which is made from Heartland, so many features are similar to ours. Their motorhome is 40 feet and has three slide outs. They came around to our rig to check out the new shed and the pantry. Unfortunately as they were leaving their truck got stuck. It was new to me that a truck could become stuck on flat grass. But it had been raining on and off for a few days and the ground was soft. Their truck is heavy in the front and they couldn't get any traction. Bill had a tow rope so Bernie towed them out. 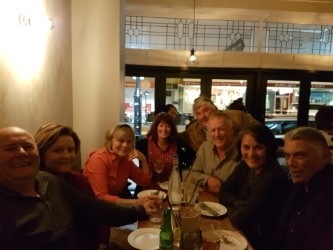 On Friday night we went along to the 'Oyster Bar' in Hardy Street for dinner. We were with Amanda & Paul, Graeme & Rachel and Bill & Mimi. From left are: Us, Mimi, Amanda, Bill, Paul, Rachel and Graeme. Nelson's Waterfront on a Warm Winter's Afternoon.